Having a family and children while at the same time studying, doing research or teaching at university is a real challenge! And the problem is not simply solved by the provision of better childcare. New strategies and a networking of family-focused services are called for. Housing situation, study plans, exam regulations, childcare options and a family-friendly environment at the workplace – all these factors are just as important as a family-friendly disposition on the part of teachers and superiors and an atmosphere at the university that clearly acknowledges the importance of family. Aachen is one of Europe's leading locations for education, science and development. It is proud to call itself a 'city of science'. 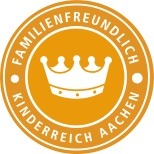 The mission of Aachen's Family Alliance (Bündnis für Familie), to which the local universities all belong, is to ensure a family-friendly environment and promote a family-friendly infrastructure. We see this as an important contribution towards making Aachen a sustainable location for innovation and science. On this website, Aachen's Family Alliance provides detailed information for students and members of academic staff who seek to manage the balance between studies, research or teaching and bringing up a family. Please note. When external links are provided for further details, they are labelled (EN) if the information under the link is available in English and (DE) if the information is only available in German.